Sometimes in life, you have to take a stand. I typically don’t allow my young sons to amass large amounts of conventional media. As a result, it shocked my 7-year-old when I recently told him to sit down and watch the news with me. I wanted him to see the story of a heroic woman named Bree Newsome. I made it a point to let him soak up as many images as possible of a valiant Ms. Newsome scaling the flagpole at the South Carolina statehouse and taking down the Confederate flag. “She looks like a soldier, Mommy, but why is she taking it down?” I responded, as I often do, with an eager, “good question, son.” Usually this retort is met with slumped shoulders and a child sinking deeper into his seat. He knows an unsolicited educational lesson is about to commence. This time, however, my “good question” was met with wide-eyed enthusiasm. The fact that someone would climb a flagpole to remove a symbol of hate and racism, shows how much children matter. This flag, which I had to sadly explain away on one of our many family road trips, was directly tied to the Confederate cause, which was connected to a deep-seated desire to uphold slavery. All children deserve to cast their eyes upward and see nothing but open sky and endless opportunities. Relics of racism and failed wars have no place blowing through the American breeze. Like a modern day Rosa Parks, Bree Newsome was quoted saying: “My prayers are with the poor, the afflicted, and the oppressed everywhere in the world, as Christ instructs. If this act of disobedience can also serve as a symbol to other peoples’ struggles against oppression or as a symbol of victory over fear and hate, then I know all the more that I did the right thing.” She took the flag down because we are free and we matter. Those who believe slavery was not a central component of the Civil War should read the documents from South Carolina, the first state to secede, as well as Georgia, Texas, and other states all claiming risk to the commerce of slavery as reasons for secession. It does not require extensive reading to understand that the words of those who bore and created this flag were words of hate and white supremacy. It is for this reason that contemporary hate groups adorn this flag with celebratory pride. It is for this reason that my parental responsibility calls for me to extend the history lessons beyond the schoolhouse walls and into my very own home. In order to truly fashion a better future, we have to acknowledge the pitfalls of the past. One of the many trials of parenthood is teaching your children which battles to pick and which trivialities they should toss to the side. Refereeing fights and dissecting end of the day grade school drama also requires a keen ability to help children discern where to plant their flag. Every action doesn’t require a reaction, but sometimes in life you have to take a stand. The term “civil disobedience,” coined by Henry David Thoreau and embodied by the life and work of Martin Luther King, sheds light on the courageous freedom fight of Bree Newsome and her fellow non-violent direct action compatriots. On a much smaller scale, I am reminded of the day my son came home with an expectation sheet from school for “unsafe behavior.” While one teacher felt it imperative that he be reminded of the school rules, a reminder of which I wholly support, another teacher proudly exclaimed to me that my son ran across the yard and retrieved a ball from a peer who had repeatedly taken it away from a fellow classmate with cognitive differences. The teacher went on to explain that she was headed in the direction to address the matter, but my son had gotten there first. It seems, on that particular day, my son was tired of witnessing the ongoing bullying of a friend. I can attest to how tired some of my fellow Americans, especially those living in South Carolina, feel. While we should always be confident in where we plant our flag, sometimes we must also have the courage to take a flag down. 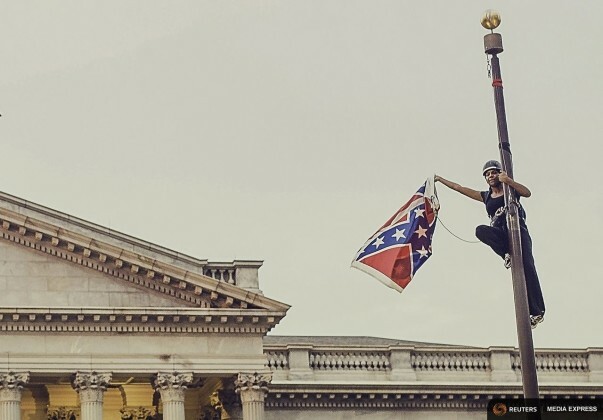 In a helmet and using a climbing harness, Bree Newsome took down the flag. On her way down she could be heard quoting Psalm 27: “The Lord is my light and my salvation—whom shall I fear? The Lord is the stronghold of my life—of whom shall I be afraid? '” She was also later quoted saying: “I refuse to be ruled by fear. How can America be free and be ruled by fear? How can anyone be?” This is the heart of the Confederate flag lesson. In a house where dramatic play often includes action figures and super heroes, this particular Bree Newsome lesson was perfect for my son’s artistic wheelhouse. Superheroes maintain a strong moral code and they are often willing to risk safety to oneself in the service of helping others. By that description, Ms. Newsome steps boldly into the limelight of the many female heroes who came before her. My son knows of Wonder Woman and the Black Widow, yet after this successful flag removal mission, he’s inspired to learn of Sojourner Truth, Harriet Tubman, Angela Davis, Fannie Lou Hamer, Shirley Chisholm, and the countless other women warriors on the front lines of humanitarian causes. Then and now, women have soldiered in the battle of good versus evil and they have climbed to new heights of freedom in their bold attempts to save the world. Ryane Nicole Granados is a Los Angeles native and she earned her MFA in Creative Writing from Antioch University, Los Angeles. Her work has been featured in various publications including Dirty Chai, Gravel, Role Reboot, For Harriet, The Manifest-Station, Mutha Magazine and forthcoming in Specter Magazine. Additionally, she teaches English at Golden West College and has authored a student success manual entitled Tips from an Unlikely Valedictorian.